Raden Putra was the king of Jenggala kingdom. He had a beautiful queen and concubine. Unlike the queen, the concubine had bad personalities. She was envious and jealous with the queen, so she planned to make the queen leave the palace. The concubine then asked the royal healer to help her in her plan. One day, the concubine pretended to be ill. Raden Putra called the royal healer to give the concubine treatments. “What is her disease?” Raden Putra asked the royal healer. “I’m very sorry, My Majesty. She is sick because the queen put poison in her meal,” the royal healer lied. Raden Putra was shock and angry to hear the explanation. He called the queen and asked her if the story was true. Of course the queen denied, but Raden Putra won’t listen. “Please Your Majesty, have mercy. I really didn’t do anything,” cried the queen in her tears. Raden Putra’s anger ended in a decision. The queen should be banished to the woods and terminated. He did not know that the queen was already pregnant. Raden Putra commanded one of his general to do the punishment. The queen was banished to the woods, but the wise general didn’t have the heart to kill her. He built a simple house in the woods for her. On his way back to the palace, he smeared his sword with rabbit blood, so Raden Putra would believe that he had killed the queen. After the general left, the queen lived by herself in the woods. Several months later, she gave birth to a healthy baby boy. The baby was named Cindelaras. He grew up as a nice, healthy, and handsome boy. One day, while Cindelaras helped her mother to collect some fire woods, an eagle dropped an egg. Cindelaras brought the egg to be brooded by a chicken behind their house. The egg hatched into a chick and then it slowly became a strong rooster. The rooster is no ordinary rooster. The rooster could sing. Every morning, the rooster woke Cindelaras up with its beautiful song, “My master is Cindelaras. His house is in the woods. He’s the son of Raden Putra.” The rooster often sang that song. Cindelaras always woke up early in the morning and listen happily to his rooster’s song. He didn’t realize the meaning of the song until one day, he started to think. “Who is Raden Putra?” he asked his mother. The queen then told him the whole story. She also told him why they were banned from the kingdom and lived in the woods. Cindelaras was very surprised. He decided to go to the palace to meet the king, his father. Cindelaras asked her mother’s permission to go to the kingdom and to tell the king what really happened. He also brought his rooster that grew bigger and stronger each day. On his way, Cindelaras stopped at a village. There, he met some people who were involved in cockfighting. They challenge him to see how strong his rooster was. “If your rooster wins, you’ll get a reward,” said the man who challenged him. Cindelaras accepted the challenge. In a few minutes, his rooster defeated the opponent’s rooster. He was challenged again by other man, and one more time, his rooster won. He won again and again. 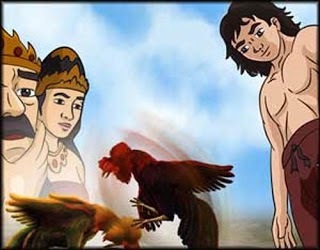 The news about Cindelaras’ rooster quickly spread to the whole Jenggala kingdom and made Raden Putra curious. So, he invited Cindelaras to the palace. “What is your name, boy?” Raden Putra asked as Cindelaras arrived in the palace. “My name is Cindelaras, Your Majesty,” Cindelaras answered. He felt both thrilled and happy to see Raden Putra.